On March 27, 2019, Indian Prime Minister Narendra Modi announced in a live address, that India had successfully tested a ballistic missile defense (BMD) interceptor missile, in an Anti-Satellite missile test against a live satellite under a codename — Mission Shakti. The test has made India the fourth nation in the world, with the capability to successfully target satellites through an Anti-Satellite (A-SAT) Missile. The United States, Russia, and China already have the A-SAT technology. In a series of tweets, the Prime Minister said "In the journey of every nation there are moments that bring utmost pride and have a historic impact on generations to come. One such moment is today. 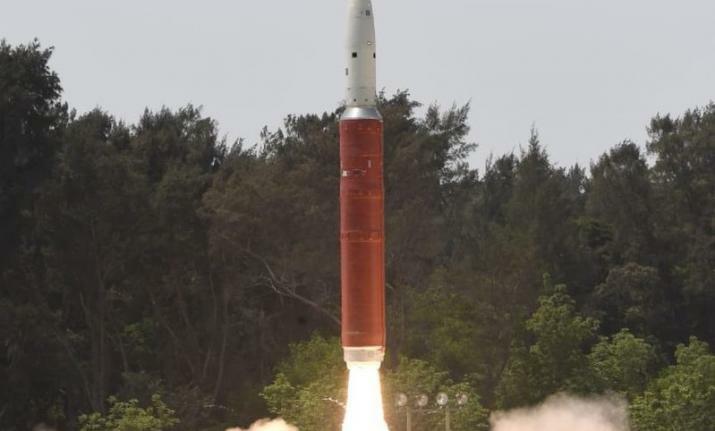 India has successfully tested the Anti-Satellite (ASAT) Missile. Congratulations to everyone on the success of Mission Shakti." According to local media reports, the target was either Microsat R (COSPAR ID:2019-006/ SATCAT no: 43947) or Microsat-TD (COSPAR ID: 2018-004T /SATCAT no: 43128) in low-Earth orbit (LEO). Neither the Prime Minister nor the ministry identified the satellite targeted by the test. According to a statement from India's Ministry of External Affairs, the missile was launched from the Defence Research and Development Organisation (DRDO)'s Abdul Kalam Island launch complex (formerly known as Wheeler Island Integrated Test Range) in the northeast part of the country. The missile struck an unidentified Indian satellite. "The test was fully successful and achieved all parameters as per plans," the ministry stated. The ministry said in its statement that the 3-minute test was designed to minimize long-lived debris. "The test was done in the lower atmosphere to ensure that there is no space debris. Whatever debris that is generated will decay and fall back onto the earth within weeks." "The test was done to verify that India has the capability to safeguard our space assets," the ministry said in its statement. "It is the Government of India's responsibility to defend the country's interests in outer space." Various opposition political parties in India have praised the DRDO scientists that worked on the project but criticized the government as the announcement came just weeks before the Lok Sabha elections begin. The Election Commission of India (ECI)'s Model Code of Conduct is in place. According to Ajay Lele, a senior fellow of the government-funded Institute for Defence Studies and Analyses (IDSA) in New Delhi, China’s 2007 A-SAT test spurred India to develop its A-SAT capability. And, by 2012 India was ready to test its own A-SAT system. However, according to the former DRDO chief Dr. V.K. Saraswat — Congress-led United Progressive Alliance (UPA) government didn't give go-ahead in 2012. He said, "We made presentations to National Security Adviser & National Security Council when such discussions were held, they were heard by all concerned, unfortunately, we didn't get a positive response (from UPA), so we didn't go ahead." He further added: "When the proposal was put up by Dr. Satheesh Reddy & NSA Ajit Doval to PM Modi, he had the courage & based on that he gave a go ahead. If the clearances were given in 2012-13, I'm quite certain that the launch would have happened in 2014-15." A similar view is shared by Former Indian Space Research Organisation (ISRO) chairman G. Madhavan Nair. He confirmed that India had the A-SAT missile capability more than a decade ago but due to the absence of "political decision" to go ahead with it at that time. China's Ministry of Foreign Affairs issued a statement in response to the PTI news agency’s query. "We have noticed reports and hope that each country will uphold peace and tranquillity in outer space." He finally concluded without naming any country, "We hope that countries which have in the past strongly condemned demonstration of similar capabilities by others will be prepared to work towards developing international instruments to prevent military threats relating to outer space."